The Keyhole (KH) satellite system KH-9 (Hexagon) operated between 1971 and 1984. The imagery generated are of historical interest and are expected to support current scientific research on climate change and related fields of inquiry. Almost all of the imagery from this camera was declassified in 2011 as a continuation of Executive Order 12951, the same order that declassified CORONA. A subset of this declassified data was transferred to the U.S. Geological Survey's Earth Resources Observation and Science (EROS) Center. Please check the coverage map in EarthExplorer to verify the extent of coverage for the subset of images available from EROS. The available images are primarily over the United States, Antarctica, and the Arctic Circle. The full collection of original film sources are maintained by the National Archives and Records Administration (NARA). KH-9 acquired photographs of the Earth’s surface with a telescopic camera system and transported the exposed film through the use of recovery capsules. The capsules, or buckets, were de-orbited and retrieved by aircraft while the capsules parachuted to earth. The exposed film was developed and the images were analyzed for a range of military and mapping applications. The KH-9 program was designed to support mapping requirements and exact positioning of geographical points for the military. The KH-9 panoramic cameras captured high resolution (2-4 feet) and moderate resolution (20-30 feet) terrain images. High resolution images were acquired on 6.5 inch wide variable length film. The moderate resolution terrain camera acquired images that were printed to 9 inch wide variable length film. High performance photogrammetric film scanners are used to create digital products at 7-micron (3,600 dpi) or 14 micron (1,800 dpi) resolution for black-and-white (B/W) images. Color images are limited to 14 micron due to resulting file size. On-demand scanning is available for $30.00 per scene for the subset of duplicate film sources held in the USGS EROS archive. * USGS EROS scans products in overlapping sections and the number of files will vary based on the length of the image. The actual file size may fluctuate due to image data, surrounding metadata, and the addition of the USGS logo. 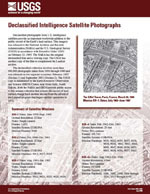 Imagery acquired by the KH-9 mapping camera with a resolution of 20-30 feet were released as part of the Declassified Satellite Imagery 2 collection. Coverage Maps indicating the availability of Declass 3 products are available for download. EarthExplorer can be used to search, preview, and download existing digital copies of Declass 3 data. For all other imagery, an order will need to be placed to scan the film at $30 per frame. The collection is located under the Declassified Data category. Mathematical calculations based on camera operation and satellite path were used to approximate geographic location. Since the accuracy of the coordinates varies according to the precision of source information, users should inspect the preview image to verify that the area of interest is contained in the selected frame.